The Grand River Rafting Company offers white water rafting on the Nith River. The white water trips are in a very small time window, after spring melt. When exactly, is unknown… only Mother Natures knows. The melt is normally in early April for about 2 weeks. With us… if the Nith River is at low volumes… we will not offer the rafting. To tentatively book this trip… you can go on our contact list… and when the Nith River is in white water conditions… we will knock on your door. Weather is also important… if lousy-no-good weather… we will not bring you here… because we want you to enjoy… not endure. We use high quality, self-bailing rafts… that will not tip over. We don’t overload our big rafts… we find 6-7 people plus the guide is perfect. 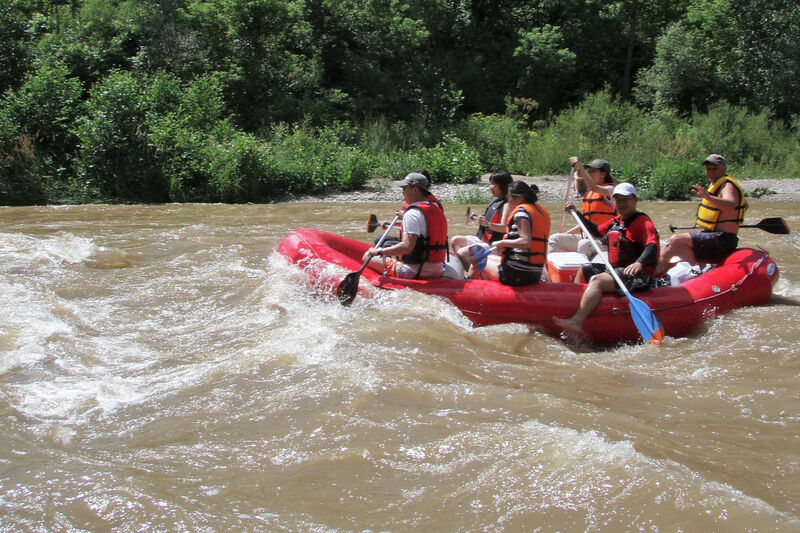 The Nith River rafting trip is 15 kms and takes 3-3.5 hours. Everyone meets at Paris to park… then meet your guide and get equipped with your gear… then shuttle upstream to the start point. At the start point we do a safety orientation and then enjoy the paddling adventure back to Paris. The Nith is a narrow river, in an amazing wilderness setting. It winds through the landscape with easy splash and slow moving water for the first 13 kms. The last 2 kms is the splash section..offering Class 2-3 waves. Allowable age is 8 years and up. These trips are guided only. Price includes boat, guide, life jackets, paddles, dry bag and your shuttle ride. We look after everything… you just bring yourselves and your lunch. If wanted, lunches can be ordered too. With us, your safety is more important then your money. If water temperatures are below 10 C or if there is ice on the river, we will not put you at risk with hypothermia. We do not offer guided kayak or canoe trips on the Nith River, because there is a much higher risk factor. We look forward to helping you discover the valley!